Anyone who thinks genies are only depicted as larger men with beards and turbans should take a look at Aristocrat Gaming’s magical pokie. 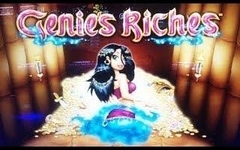 Genie’s Riches features a sultry female magician who grants the wishes of players by bringing them extra rewards such as free spins, scatters and wild wins. Played out over 5 reels, with 30 paylines, it’s a typically bright and colourful game from this popular developer and with a minimum stake of just 0.30 per spin and a maximum win of 2000x the line bet, it’s got to be better than rubbing a lantern for bringing in potential riches. The game plays out against a simple backdrop of stone columns, which don’t distract from what’s happening on the reels at all. There’s a nice purple hue to the actual reels and colourful symbols of gold, magic carpets and treasure adorn them, along with the playing card symbols, each given a bit of a re-design to go with the theme, that make up the lower value wins. Players get a reward for landing rows of matching symbols on a line, across adjacent reels running from the left side. Either 2 or 3 are needed, depending on which symbols they are, while the scatter will pay out in any positions. A detailed payout schedule is available and this lists each winning combination, shows where each payline runs from and explains the how the bonus features work. Looking at this, players will see that the card symbols 9, 10, J, Q, K and A will feature prominently in any spin, with the 9 and 10 being worth 5x the line bet when 3 stop across one, 25x for a row of 4 and if a full line of these symbols land across the reels, players win 100x their stake per line back. Going up the payscale, the A is the most valuable card icon and rewards 15x, 75x or 200x for the same combinations. More is won with the picture symbols however, with a jewel-encrusted gold bracelet, crossed scimitars, flaming torch, flying carpet and the magic lantern all topped off in value by the genie herself. She will return 10x the line bet when just 2 appear, while a full line right across the reels will be worth 2000x. Not only is she a very rewarding symbol to land, but she’s also the wild, so can also act as all others, with the exception of the scatter, if she completes winning lines by doing so. The Scatter symbol is a treasure trove of gold, vases and jewels. It’s got magical powers all of its own, as landing it in any 3, 4 or 5 positions will win 2x, 20x or 100x the total stake per spin, rather than just the line bet. It will also take players to the bonus spins game, which may only consist of 5 spins, but there’s a couple of extra treats in there that can make this a highly valuable round to trigger. The lantern symbol takes on special qualities in the free spins game, as each time it appears, it’s added to a meter, with the number of lanterns collected during the spins added up at the end. It’s possible to get 15 of them, although pretty unlikely, however, any are better than none as once the 5 main spins are completed, players get extra wilds added to the reels for a single Genie Spin. The number of wilds added is the same as the number of lanterns collected, so having 15 on the reels is going to make the Genie Spin a big winner. If 3 or more scatters had appeared during the free games, the feature will be re-triggered. Genie’s Riches should be assured of success thanks to a popular theme, nice design and pleasing bonus features. It may have just a single side game, but it’s a good one, that can result in some big payouts with that extra spin added to the end, while the bonus round can be fairly easy to trigger, with just 3 scatters needed to enter it. 30 paylines across 3 rows of symbols should be enough to make this a low volatility game, where players win a higher number of smaller payouts, rather than just a few bigger ones and this format tends to be more popular, as few people are happy watching the reels spin over and over for no rewards. There’s usually a couple of downsides worth mentioning in any pokie review, but Genie’s Fortune is a nice, straightforward game that’s difficult to criticise. Maybe more free spins would have been nice, but that’s about it.